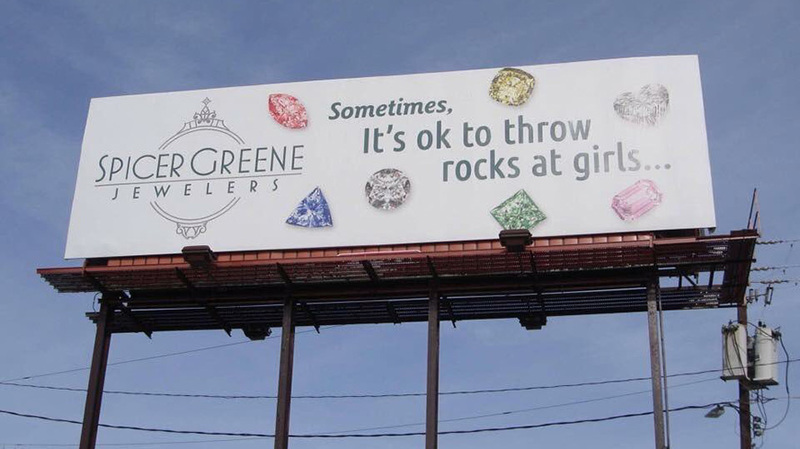 Asheville, N.C., jewelry store Spicer Greene Jewelers’ newest billboard, with pictures of gemstones surrounding the headline “Sometimes it’s OK to throw rocks at girls,” has invited some understandable backlash this week. The billboard was officially rebuked by Chelsea Clinton, and protests have been planned by members of local organizations, including the Women’s Rights Committee, Stronger Together WNC North and Indivisible Asheville’s Equal Rights Amendment Committee. The offended parties claim that the slogan normalizes and trivializes violence against women, and Spicer Greene has apologized for the billboard, claiming they meant no offense. They also claim the slogan is based on a common expression in their industry, which fits the store’s pattern of saying things that sound way, way worse than intended. It’s worth noting that many of the responses to Spicer Greene’s Facebook mea culpa (“We intended the billboard as a play on words to encourage the loving act of gift giving and are deeply saddened that it offended anyone,” the store said, in part) defended the billboard as a funny, harmless one-liner to which people are overreacting. Problem is, the humor here hinges on the stereotype of women being shallow and materialistic, and that’s before the hilarious zinger about stoning them. Like, who wrote this and read it back to themselves without seeing any of this? Perhaps they’d overindulged in the other kind of stoning Asheville is known for.